On Saturday 9th July, you will be forgiven for doing a double-take if you come across a merry band of superheroes running a hospital bed through the streets of Bristol. Don’t be alarmed – they’re just doing their bit to make the world a better place. 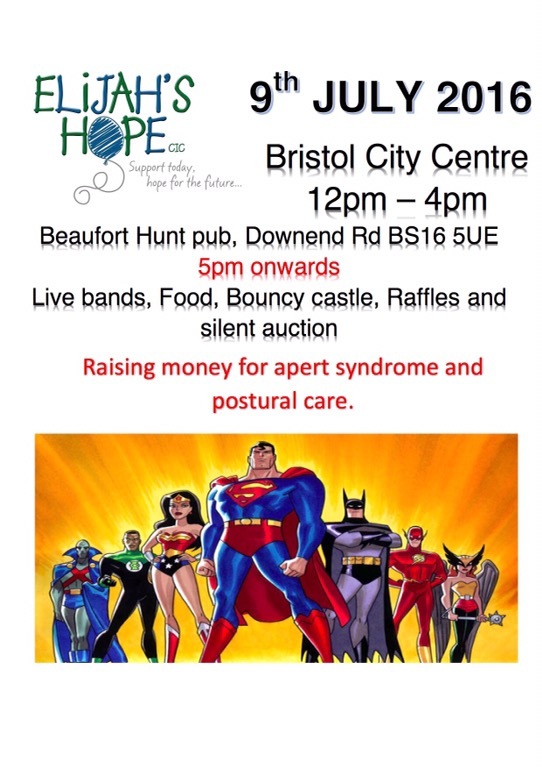 Superheroes from Wonder Woman to the Green Arrow will be ditching their mild-mannered alter-egos and donning their capes and masks to complete a bed run to raise money to promote postural care and help support individuals with Apert Syndrome for Elijah’s Hope CIC. The Superhero Bed Run will set off at noon from outside of the Bristol Royal Infirmary Hospital. The walkers/runners will be pushing a hospital bed from the city centre to Broadmead, Horsefair and Cabot Circus, then on to St. Nicholas Market, Corn Street, Baldwin Street and back to Bristol Royal Hospital. Those taking part in the bed run will be collecting money en route. Elijah’s Hope would welcome any super-heroes who would like to join them for some or all of the bed run on Saturday 9th July, so why not dust off your tights, pop on your giant underpants and wear your cape with pride? Alternatively, if you cross paths with the bed run, please do make a donation if you can – you’d very much be a hero in our eyes. Any money raised will go towards the organisation’s extensive work to promote the benefits of correct postural care. If you do want to take part in or support the bed run, the runners will end the day by heading to the Beaufort Hunt pub in Downend from 5pm onwards. Here, there will be a live band, a silent auction, raffle prizes and a bouncy castle. We will continue raising money throughout the evening. Elijah’s Hope CIC is named after 10-year-old Elijah, son of the bed run organiser, Kaddy Thomas. The organisation campaigns for and supports severely disabled children and their families in every aspect of their lives. Elijah was born with Apert Syndrome, a congenital disorder characterised by deformities of the skull, face, hands and feet. The condition affects less than one in 150,000 people. When he was just one year old, Elijah underwent surgery to address issues caused by Apert Syndrome. He later developed an infection at the wound site, which ultimately left him severely brain injured. Elijah is now a wheelchair user and also suffers epilepsy, scoliosis and a seriously distorted body shape – the impact of which means his left lung is being squashed. Elijah has a high muscle tone, which has caused both hips to dislocate, and has excessive secretions affecting his breathing. He cannot eat or drink orally and, in addition, has osteoporosis, a heart murmur and a cleft of the soft palate. Apert Syndrome is hereditary and something that his mum, Kaddy, also suffers from, although she is largely able to live a healthy life. Through Elijah’s experiences, Kaddy has seen first-hand how body shape distortion, which is typically experienced by people with limited mobility, can have devastating consequences and create serious additional health problems. But where once people treated body shape distortion as inevitable, we now know that correct postural care can make a big difference towards preserving body shape and preventing unnecessary health complications. Postural care is about making sure that people who are at risk of developing changes in their body shape are supported as symmetrically as possible, as comfortably as possible, 24 hours a day. It involves equipment such as wheelchairs, walking aids, standers, alternative seating, orthotics and night-time positioning equipment. It is helped by active therapy and encouraging movement and is directed by measurement of body symmetry. Most importantly, postural care involves individuals, their families and personal assistants working alongside health and social care practitioners to co-produce effective, person-centred solutions to often complex challenges. If postural care can be prioritised and incorporated into daily life, there is a very real possibility of realising a world where hip dislocation in children like Elijah is seen as the glaring exception rather than the accepted norm, a world where children no longer need to undergo radical spinal surgery, and individuals of all ages can live with minimal chronic pain and discomfort. In 2015, Elijah’s Hope ran its first international conference on postural care, providing a platform for leading practitioners and thinkers to share best practice. On 14th and 15th September 2016, this year’s Postural Care “It’s all about family” Conference will take place at the Hilton Hotel in Bristol and will, once again, strive to bring postural care to the forefront as a proven way to prevent a wide number of health problems and relieve pressure on NHS services. 4. Elijah's Hope is a non-profit Community Interest Company founded by Kaddy Thomas, to help families who have physical disabilities in particular the rare condition, Apert syndrome. 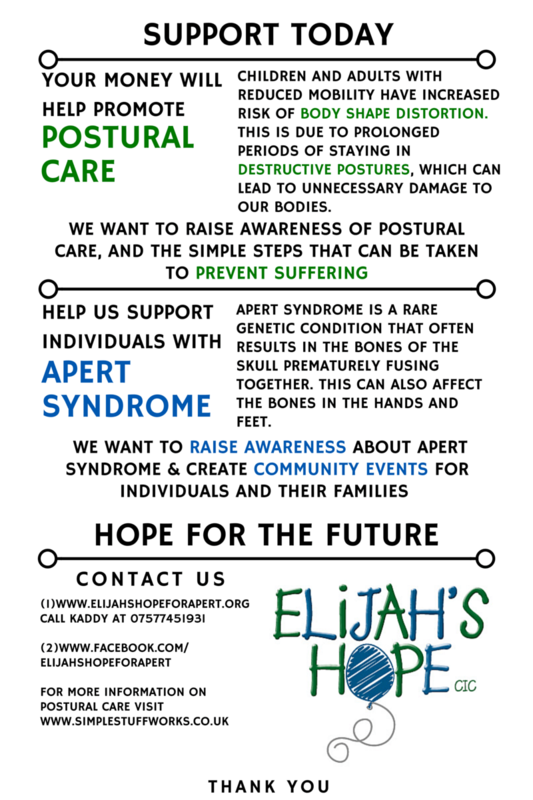 Tagged apert syndrome, bed run, elijahs hope, postural care, rare disease.